Frigidaireís Affinity electric dryer series introduces several advanced technology features. 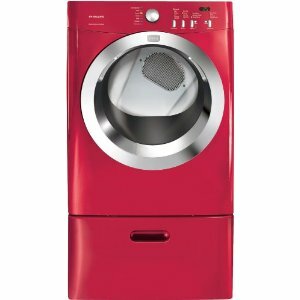 The model brings washing loads to bigger level thanks to its Ultra-Capacity and Fits-More abilities. These two features combined allows owners to do more laundry and put in more than one load at a time. Thereís also its NSF certification, guaranteeing users 99.9 percent bacteria free laundry. This Affinity series model includes a wide range of top notch drying functions. Apart from those previously mentioned, the Frigidaire dryer also offers TimeWise technology and Express-Select controls. Express-Select controls allow users to quickly select their desired drying cycle and preferred temperature option by simply pushing a few buttons. TimeWise Technology lessens the time one waits for clothes to dry. Drying clothes is made much faster with the dryerís Save Your Settings feature. This lets users automatically save their previous settings, letting them save time during their next run. Thereís also the Quick Cycle, which only lasts 25 minutes. Quality drying performance is delivered with the modelís numerous cycle options, dryness levels and temperature settings. The model has seven cycles that include a heavy, casual, delicate, and time dry cycle. Cycle signal lights are there to indicate the status of the drying process. Temperature options cover all kinds of fabrics. The Sanitize temperature setting cleans out any bacteria that may have been missed by the washing stage. High to maximum temperature ensures that damp clothes are thoroughly washed. Low to medium temperature options are for lighter to more delicate fabrics. Thereís also the Air Fluff or No Heat option for clothes that donít require as much heat for drying. This model is available in classic red, black, white, or blue colors. The painted steel drum finish gives it a stylish modern look. With a moderate size of 7.0 Cu Ft, the model provides just enough space for an average familyís laundry load. Easy to read and select temperature and drying cycles thanks to its Express-Select controls. Even the most technophobic can readily comprehend the button selections this model features. Buyers can go for the Control lock option to secure the dryer from young children in the home. It also protects the model from any accidents in case of mishaps with the door. Clothes can be cleaned efficiently thanks to the dryerís NSF-certified Sanitize temperature option. The wide range of cycle options allow users to run almost any kind of fabric, from heavy sets of towels to more delicate types like underwear. Users who are in a hurry can select the 25-minute dry cycle for clothes that need to be used as soon as possible. Although drying cycles are enough, the model doesnít offer settings for more unique fabrics. Cycle options donít include a steam cycle that can reduce the likelihood of winkles and static cling. s are enough, the model doesnít offer settings for more unique fabrics.